Monica, AKA StarryNites, and her designer friend Nat have created Promo Cards for David’s fan pack available on Fans of David. 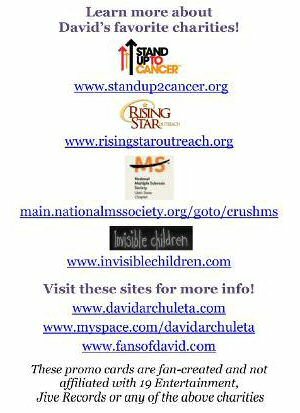 The cards include information about purchasing David’s Fan Pack, as well as some links to his favorite charities. They are looking for volunteers to print and distribute them. You can go to the site and print and distribute! Choose from Three Different Card Designs. The above picture is the card I have decided to have printed. I will be passing them out at the Los Angeles and Las Vegas concerts! 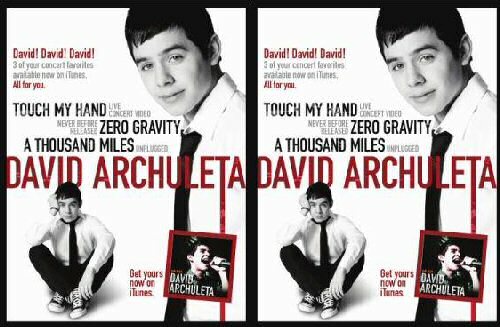 Please get involved and help David promote his fan pack and album. We are all looking for ways to get him to Platinum Status; this is a start. 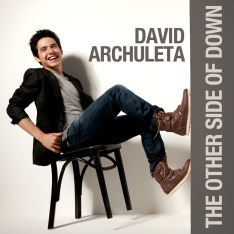 Meet new fans, get involved, it’s all for David Archuleta and the many charities he represents. Thank you for taking the time to help! I like the touch my hand one. its really good and I would not mind passing them out. this is a wonderful Idea.